Boston Latin School seventh-grader Michael Gross Jr. won himself a cash prize and a trip to the statehouse as the winner of the annual Massachusetts Credit Union Leagues essay contest. From left, Michael Gross Sr., Marilyn Gross, Michael Gross Jr. and Nancy Gross. 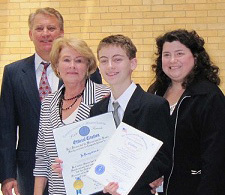 Boston Latin School seventh-grader Michael Gross Jr. won himself a cash prize and a trip to the statehouse as the winner of the annual Massachusetts Credit Union League’s essay contest. The theme was “people helping” people. Gross was sponsored by the $453 million IC Federal Credit Union of Fitchburg, Mass. The seven finalists were treated to a luncheon and awards ceremony at the statehouse.